Located in desirable Pacific Heights on a tree-lined street, this Mediterranean style home features a classic red tile parapet, ornate wrought iron balcony and plaster ornamentation. The beautifully proportioned public rooms feature Neo-Classical architectural detail set against high ceilings, large picture windows with transoms & sidelights and lovely hardwood floors throughout. The floor plan is ideal for entertaining indoors & out and for comfortable family living. 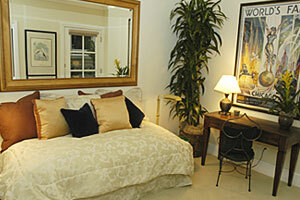 Convenient to Fillmore Street & Laurel Village shopping & dining and nearby Alta Plaza Park. Inlay clay tiled steps lead to the striking foyer entrance and wide staircase to the magnificent CENTER HALL. Several pairs of flat Doric columns grace the tall doorways to the public rooms and east balcony. Deep crown molding and alabaster sconces add to the inviting warmth found in all the main floor rooms. 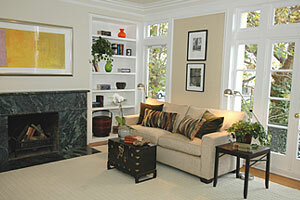 The light & airy LIVING ROOM features a fireplace with built-in bookcases and large double hung windows with transoms. 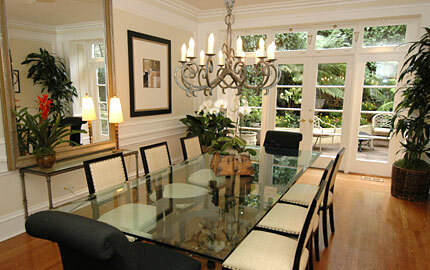 The formal DINING ROOM is ideal for large sit-down dinners. French doors open to the PATIO/GARDEN. A wide doorway opens to the heart of the house: the grand KITCHEN/FAMILY ROOM for informal entertaining and comfortable daily living. Custom maple cabinetry, marble countertops and work island house top-of-the-line appliances, including a Dynasty six-burner gas stove & Sub-Zero refrigerator/freezer. The Media Area features a cozy fireplace and built-in entertainment center which can be enjoyed while cooking or having informal meals in the sunny breakfast area with large skylight. Step out to the delightful, trellised PATIO/GARDEN for alfresco dining & leisure. A guest closet and GUEST BATH off the center hall complete this level. Double skylights infuse the handsome staircase with natural light. The picture gallery with double hanging alabaster bowls leads to the spacious MASTER BEDROOM with marble fireplace & built-in bookcases, large transomed windows, and a view to the northeast of Russian Hill. Very large walk-in closet for his & her wardrobes. Luxuriate in the MASTER BATH with the spa tub & steam shower. 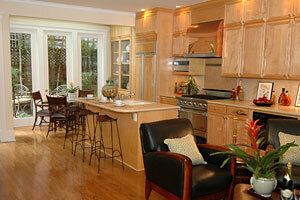 A large picture window is screened with tall bamboo for privacy and double skylights bring in natural light. The bathroom features a marble surround with large maple double vanity, double mirrors & sconces. The two sunny south facing BEDROOMS look out to greenery and share a tiled full BATH. The SITTING ROOM & BEDROOM with full BATH is ideal for extended family members or house guests, or as a convenient at-home office. The landscaped, decked light-well allows much natural light to brighten these rooms. Laundry room with chute from 2nd floor, utility room and two car side-by-side GARAGE with interior access.